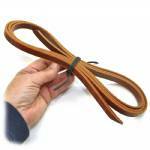 Saddle strings are the long narrow leather straps that hang from either side of the pommel and cantle of a Western saddle. They are used to tie slickers, saddle bags, and other items to the saddle. Because they get hard use, saddle strings need to be replaced occasionally. I hand cut each saddle string from pliable, strong, Santa Ynez latigo. Each string is 1/2" wide and at least 72" long and is a deep burgundy color. The corners of the strap are rounded over to feel good in the hand. Note: The narrow saddle strings shown here are not the same as the wide "latigo" straps used to fasten a cinch onto a saddle.